All praise belongs to Allah and may the Peace and Blessings of Allah be upon the most noble of Prophets and Messengers; our Prophet Muhammad, and upon his family members, companions, and those whom follow them in truth until the Day of Judgment. 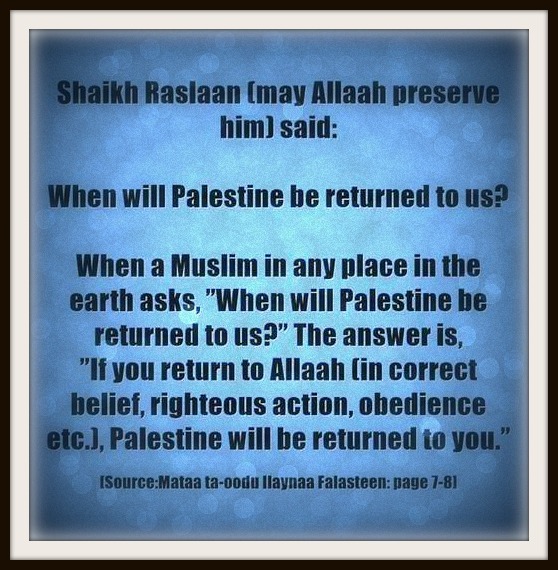 When will Palestine be returned to us? He (The Blessed and Most High) clarified that being thankless for blessings bestowed (on us) will cause it to cease…. Our scholars say, ”Blessings are a prey and being thankful (for it) is the thing that makes (it) remain.